[Lat., =king-killers], in English history, the name given to those judges and court officers responsible for the trial and execution of Charles I in 1649. After the Restoration (1660) of the monarchy they were excepted from the general pardon granted by the Act of Indemnity. At that time 41 of the 59 signers of the king's death warrant were still alive. Fifteen of them fled: William Goffe, John Dixwell , and Edward Whalley went to New England; several went to Germany and Holland; and Edmund Ludlow and four others went to Switzerland. Some were able to convince Charles II that they had had little to do with his father's trial and that they were loyal to the monarchy, and they were reprieved. Nine of those who signed the warrant and four others closely connected with the trial were hanged. Six others, who were deemed less politically dangerous, were imprisoned for life; some were later reprieved. The reign of republicanism in England, under Oliver Cromwell and his son, was short. King Charles the First, after contending with the people for the royal prerogative and the throne for several years, was beheaded on a cold winter's morning in January, 1649, in front of his own palace of White hall. Royalty was then abolished. Late in May, 1660, the son of Kind Charles, who had been proclaimed monarch of England under the title of Charles the Second, rode into London on horseback between his brothers the Dukes of York and Gloucester, and took up his abode in the palace of Whitehall, while flags waved, bells rang, cannon roared, trumpets brayed, shouts rent the air and fountains poured out costly libations of wine as tokens of the public joy. After a struggle for about twenty years between royalists and republicans, the monarchy was restored, and the English people again became subjects of the head of the Scottish house of Stuart. The members of the House of Commons hail constituted a High Court of Justice for the trial of Charles the First, and many of then, signed his death-warrant. These were hunted by the royal vengeance. Some perished on the scaffold. Among these were Hugh Peters and Henry Vane, who had figured conspicuously in New England more than twenty years before. Many fled and so escaped the fatal block. Among these were Edward Whalley and William Goffe, who went to New England and gave the first news of the restoration of monarchy. The former was a cousin of Cromwell and of Hampden, and a distinguished cavalry officer. He had been entrusted with the custody of the royal prisoner, and was one of the signers of his death-warrant. Cromwell appointed him one of the major-generals who assisted in the government of the commonwealth, and was one of his most active lieutenants. Goffe, a son of a Puritan clergyman, was Whalley's son-in-law, a colonel of infantry and member of the High Court who signed the death-warrant of the king. He, also, was one of Cromwell's ten major-generals. Orders speedily followed the fugitives to New England for their arrest, and officers came from Old England for the same purpose. The "regicides," or king-killers, as they were called, were, after awhile, closely hunted, but the authorities and people of New England effectually concealed them from their enemies for years. When danger lowered, they fled from Boston to New Haven , and for a long time occupied a cave not far from that place. Finally they made their abode in the remote town of Hadley, where they were joined by Colonel John Dixwell, another "regicide," who finally settled in New Haven. In Hadley, Whalley died. Goffe survived him until after King Phillips war; but from the time when they took up their abode there, in disguise, they disappeared from public view. During that period, so terrible to New England settlers, Hadley was surrounded by hostile Indians. The people were in the meeting-house observing a fast day. They were armed, as usual, and sallied out to drive off the savages. At that moment a tall, venerable personage, with a white, flowing beard, clad in a white robe and carrying a glittering sword, suddenly appeared among the people, took the lead of the armed men, caused them to observe strict military discipline, and led them to victory. The people believed the stranger (who as suddenly disappeared) to be an angel sent by the Lord for their deliverance. The angel was General Goffe, who was stout in body and valiant in spirit. It is related that soon after his arrival in Boston, a fencing-master erected a stage on the Common, on which he walked several days, defying any man to fight him with swords. Goffe accepted the challenge. He wrapped a huge cheese in a linen cloth as a shield, and arming himself with a mop filled with muddy water from the gutter, he appeared on the platform. The fencing-master made a thrust at him, which Goffe received in the cheese in which he held the sword until he had smeared his antagonist with mud. The enraged fencing-master caught up a broad-sword, when Goffe exclaimed: "Stop, sir; hitherto, you see, I have only played with you, and not attempted to harm you but if you come at me now with the broadsword, know that I will certainly take your life." The alarmed fencing-master cried out, as he dropped his sword, "Who can you be? You must be either Goffe, or Whalley, or the Devil, for there were no other men in England who could beat me." - - - Benson J.Lossing, LL.D. Charles had good reason to feel that the governments of New England were assuming too many airs of sovereignty. There were plenty of people at hand to work upon his mind. The friends of Gorton and Child and Vassall were loud with their complaints. Samuel Maverick swore that the people of New England were all rebels, and be could prove it. The king was assured that the Confederacy was "a war combination, made by the four colonies when they bad a design to throw off their dependence on England, and for that purpose." The enemies of the New England people, while dilating upon the rebellious disposition of Massachusetts, could also remind the king that for several years that colony bad been coining and circulating shillings and sixpences with the name "Massachusetts" and a tree on one side, and the name "New England" with the date on the other. There was no recognition of England upon this coinage, which was begun in 1652 and kept up for more than thirty years. Such pieces of money used to be called "pine-tree shillings" but, so far as looks go, the tree might be anything, and an adroit friend of New England once gravely assured the king that it was meant for the royal oak in which his majesty hid himself after the battle of Worcester! Against the colony of New Haven the king had a special grudge. Two of the regicide judges, who had sat in the tribunal which condemned his father, escaped to New England in 1660 and were well received there. They were gentlemen of high position. Edward Whalley was a cousin of Cromwell and Hampden. He had distinguished himself at Naseby and Dunbar, and had risen to the rank of lieutenant-general. He had commanded at the capture of Worcester, where it is interesting to observe that the royalist commander who surrendered to him was Sir Henry Washington, own cousin to the grandfather of George Washington. The other,regicide, William Goffe, as a major-general in Cromwell's army, had won such distinction that there were some who pointed to him as the proper person to succeed the Lord Protector on the death of the latter. He had married Whalley's daughter. Soon after the arrival of these gentlemen, a royal order for their arrest was sent to Boston. If they had been arrested and sent back to England their severed heads would soon have been placed over Temple Bar. The king's detectives hotly pursued them through the woodland paths of New England, and they would soon have been taken but for the aid they got from the people. Many are the stories of their hairbreadth escapes. Sometimes they took refuge in a cave on a mountain near New Haven, sometimes they hid in friendly cellars; and once, being hard put to it, they skulked under a wooden bridge, while their pursuers on horseback galloped by overhead. After lurking about New Haven and Milford for two or three years, on hearing of the expected arrival of Colonel Nichols and his commission, they sought a more secluded hiding place near Hadley, a village lately settled far up the Connecticut river, within the jurisdiction of Massachusetts. Here the avengers lost the trail, and the persuit was abandoned.The People of New Haven had been especilally zealous in shielding the fugatives.Mr. Davenport had not p;u harboured them in his own house, but on the Sabbeth before their expected arrival he had preached a very bold sermon, openly advising the people to aid and comfort them as far as possible. The colony moreover did not officially recognize the restoration of Charles II to the throne till that event had been known on New England for more than a year. For these reasons the wrath of the king was especially roused against New Haven. Regicides, in English history, were judges and court officers responsible for the trial and execution of Charles I in 1649. After the Restoration (1660) of the monarchy they were excepted from the general pardon granted by the Act of Indemnity. 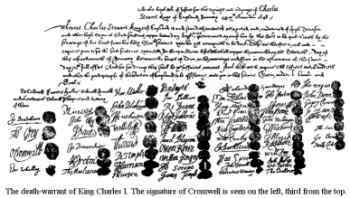 At that time 41 of the 59 signers of the king's death warrant were still alive. Fifteen of them fled: William Goffe, JOHN DIXWELL, and Edward Whalley went to New England; several went to Germany and Holland; and Edmund Ludlow and four others went to Switzerland. Some were able to convince Charles II that they had had little to do with his father's trial and that they were loyal to the monarchy, and they were reprieved. Nine of those who signed the warrant and four others closely connected with the trial were hanged. Six others, who were deemed less politically dangerous, were imprisoned for life; some were later reprieved. died c.1679, English soldier and regicide. A personal adherent of Oliver Cromwell, he fought in the English civil war, signed the death warrant of Charles I, and became an administrative major general during the Protectorate. He was excepted from the Act of Indemnity (at the Restoration) and fled with his father-in-law, Edward Whalley, to America. After short periods in Cambridge (Mass. ), New Haven, and Milford (Conn.) he lived in seclusion at Hadley (Mass.). The tradition that he headed the citizens of Hadley in repelling an attack by Native Americans was used by Sir Walter Scott in his Peveril of the Peak and by James Fenimore Cooper in his Wept of Wish-ton-Wish. d. c.1679, English soldier and regicide. A personal adherent of Oliver Cromwell, he fought in the English civil war, signed the death warrant of Charles I, and became an administrative major general during the Protectorate. He was excepted from the Act of Indemnity (at the Restoration) and fled with his father-in-law, Edward Whalley, to America. After short periods in Cambridge (Mass. ), New Haven, and Milford (Conn.) he lived in seclusion at Hadley (Mass.). The tradition that he headed the citizens of Hadley in repelling an attack by Native Americans was used by Sir Walter Scott in his Peveril of the Peak and by James Fenimore Cooper in his Wept of Wishton-Wish. d. 1675?, English regicide. During the English civil war he served under his cousin Oliver Cromwell in the parliamentary army. He was given custody of Charles I for a time in 1647, served on the high court of justice that tried him, and signed the death warrant. After 1655, Whalley was one of the major generals who ruled the country until the restored Long Parliament withdrew his commission and those of other prominent Cromwellians. At the Restoration (1660), Whalley, with his son-in-law, William Goffe, fled to New England. He lived successively in Boston, New Haven, Milford (Conn.), and Hadley (Mass. ), hunted by English agents but never betrayed.